In the ranch of the Barbie has escaped the pigs of the stable, but calm that that is why her boyfriend Ken. Interact with this character riding on the back of his horse as in the wild west and his rope in a loop to capture all the pigs. You will have to dodge all the obstacles you get along the way so you do not lose your life. If you prefer you can play it in the APP or on any device with an Internet connection. Have a good time at Barbie's ranch. 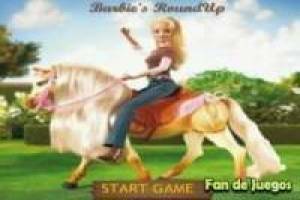 Enjoy the game Ranch Barbie, it's free, it's one of our horses games we've selected.